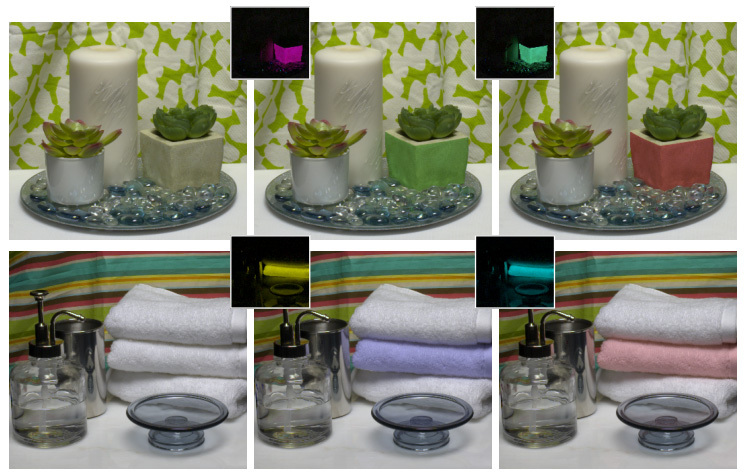 We present a novel measurement-based method for editing the albedo of diffuse surfaces with consistent interreflections in a photograph of a scene under natural lighting. Key to our method is a novel technique for decomposing a photograph of a scene in several images that encode how much of the observed radiance has interacted a specified number of times with the target diffuse surface. Altering the albedo of the target area is then simply a weighted sum of the decomposed components. We estimate the interaction components by recursively applying the light transport operator and for- mulate the resulting radiance in each recursion as a linear expression in terms of the relevant interaction components. Our method only requires a camera-projector pair, and the number of required measurements per scene is linearly proportional to the decomposition degree for a single target area. Our method does not impose restrictions on the lighting or on the material properties in the unaltered part of the scene. Furthermore, we extend our method to accommodate editing of the albedo in multiple target areas with consistent interreflections and we introduce a prediction model for reducing the acquisition cost. We demonstrate our method on a variety of scenes and validate the accuracy on both synthetic and real examples. We wish to thank the reviewers for their constuctive feedback, and Victoria Cooper and Kathleen Moore for proofreading. This work was partially funded by NSF grants: IIS-1217765 and IIS-1350323, and a gift from Google.